DAZ Studio | Remember Design? Me, programs, examinations and coursework. As most of you already know, I’m a pretty big fan of video games artwork and 3D CGI artwork. I just love it. It is just simply amazing. And awesome. And the people just look so… brilliant and cool and everything! So, today, I think I can join the circle of people who produce things like this. 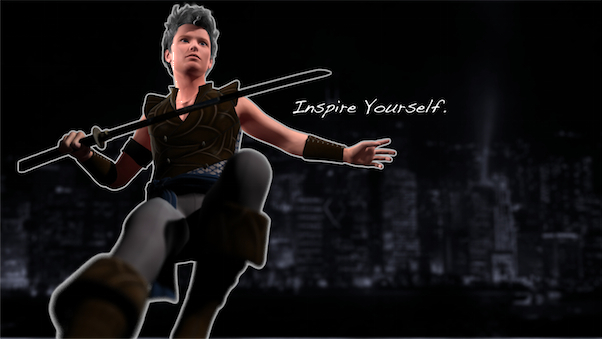 "Inspire Yourself." As a writer, I know what these words mean. The DAZ 3D logo. Image via Wikipedia. I know it looks brilliant, and awesome, but actually it was only created in a couple of minutes on DAZ 3D software’s DAZ Studio 4 Pro, on Alex. I think the only reason why it’s so powerful is because of Alex’s own built-in GPU, something I have found very helpful in rendering fractal landscapes and now, my wallpapers. I’m not sure what made it a wallpaper. I just knew then when I had rendered the image, I wanted it to have some kind of symbolism. So I added a background and some text, and it turned out to be a wallpaper. Well, I’m not objecting. I could use something else to stare at in times of creative poverty now. The background is a lovely photograph of Hong Kong’s night skyline. As a proud part of Hong Kong, I couldn’t resist putting that image in when I saw it. I’m pretty sure it’s public domain, but if it isn’t, I’d be more than happy to cite you. Remember Design? has migrated and is now renamed Streaming Rain. This blog is still kept for archival purposes. Hi there! I'm a blogger attending school. While this doesn't just make me kind of awesome, it also means that I'm very busy most of the time trying to survive the wraths of education. I love posting (with a passion), but as much as it's enjoyable, school comes first! If I haven't posted recently, check out my writing journal, which hosts my fictional stories and also statuses on my general health and reasons why I haven't been posting. You can also find out more about the blog in general at the About page. Kono uebusaito o homon shitekurete arigato! Ohayo! Enter your email address and receive notifications of new blog posts and work updates by email! What do we know about the next iPhone’s design so far? Note: I cannot guarantee that all content on external sites linked from here are not objectionable. I'm simply too small to affect the entire Internet. If you feel that I have linked to inappropriate content, please comment on the appropriate page and alert me to this fact.